Bloodborne is a PlayStation 4 exclusive developed by From Software, the creators of games such as Demon’s Souls and Dark Souls. 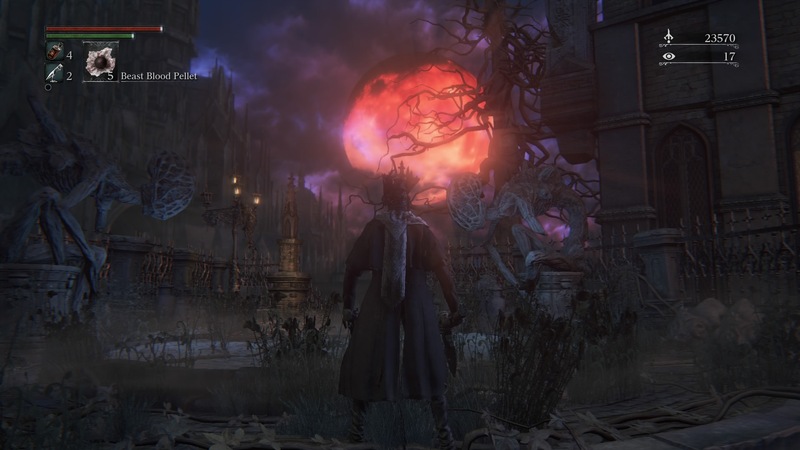 While not officially a “Souls” game, Bloodborne follows in the footsteps of its predecessors, using the same core game mechanics. Despite that, it stands above past material as both a game and an experience. 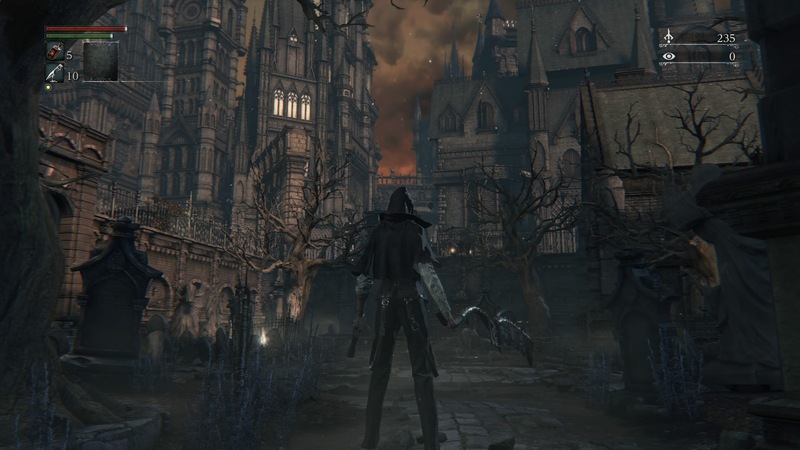 Bloodborne takes place in Yharnam, a city overrun by an endemic illness that seemingly changes humans into madmen and beasts. The player character is a Hunter, one of those tasked with eliminating the beasts and finding the source of the scourge. 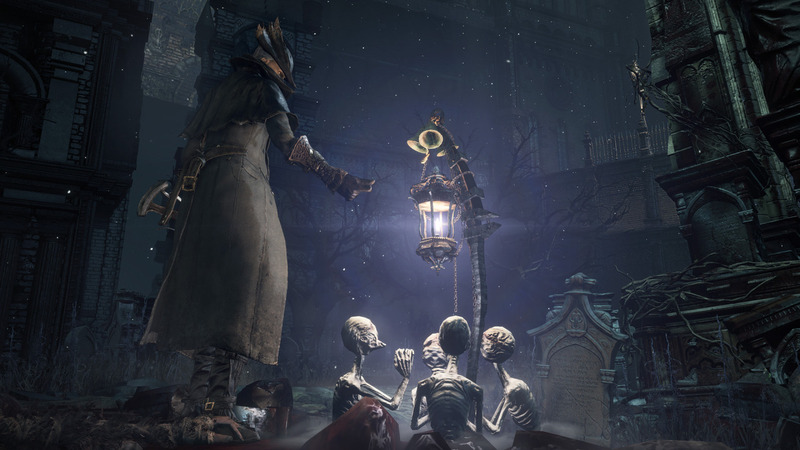 This journey takes the player across Yharnam and its surroundings, as the source of the plague and its role in shaping the world slowly become clearer. The story is very atypical, both in content and presentation. There are two halves to this that blend together as it progresses, the first of which is Gothic horror. 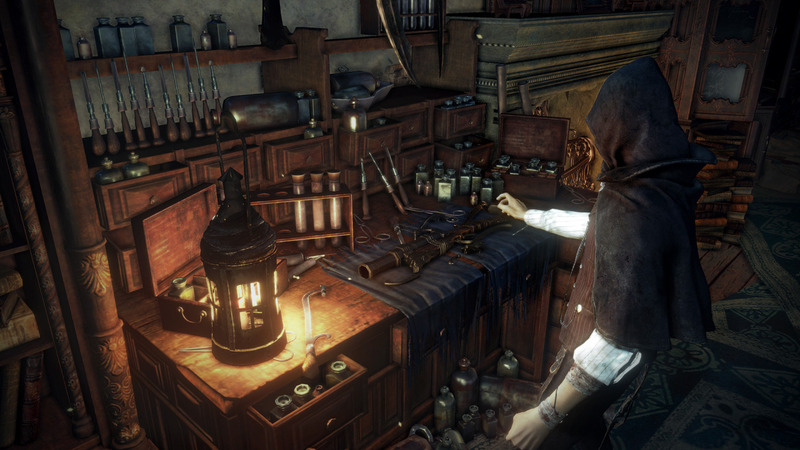 The focus during this part of the story is on Yharnam, with its imposing architecture, madmen, and beasts, along with the illness and all parties involved with “the hunt.” As the plot moves forward, things slowly take a turn for the bizarre, heavily influenced by the works of H. P. Lovecraft – supernatural horror that both muddles and reaffirms details of the story. Instead of getting an easy to follow progression of events, you’ll play through many parts that don’t necessarily seem related on the surface. The majority of the details that fill in the blanks are in the game’s lore – the easy to miss things that people say, the item descriptions, even the design and characteristics of the enemies and NPCs themselves. If you hypothesize, look into the lore and influences, and check out others’ theories, you will not be disappointed by the depth of ideas about the nature and truth of the story. But if you’re looking for something that initially comes off as at least somewhat logical, you will be left sorely disappointed by a string of seemingly random occurrences and downright incomprehensible endings. Personally, I think that it’s far too ambiguous at many points and a bit of clarity would be preferred. But the extremely high attention to detail with the world’s creation nullifies most of my complaints, as there is a reason for everything – the reason might not be obvious, but it’s generally deducible or at least hinted at. While the story itself is very interesting, without a doubt the best parts of this game are the setting and atmosphere. Buildings loom over you, overgrowth is twisted and dead, and the city’s paths wind around each other to create a maze. The visuals and sound work together to add to this oppressive atmosphere, constantly filling you with a sense of dread at what’s to come. Exploration, while rewarding, can never be taken lightly, as there’s always the potential for an enemy to be lying in wait around the corner. Visually, everything is quite dark, but there is still a good variety in both lighting and actual surroundings, one reason being the night’s progression. As you advance through the story, the night will grow longer – the game starts in the evening, reaches sunset, and then the dead of night, with the world lit by the glow of the moon. And then, even that changes as you near the conclusion. The game is full of beautiful and haunting locales, such as the Upper Cathedral Ward, Yahar’gul, and Byrgenwerth. Taking everything in while navigating these interwoven areas is definitely one of the most enjoyable aspects of the game. While the visuals look very nice, there are clear technical issues. Most common are frame-rate drops, which manifest frequently in a few specific areas, or when there are well over ten enemies on the screen. In some of these situations, rather than the entire game’s frame-rate tanking, individual enemies’ animations will stutter while other things on screen proceed as usual. There is also occasional texture popping, normally after spawning in an area. For most of the game, the majority of what you’ll hear is simply ambience – screams of the damned, crying infants, delusional rants, infinitesimal whispers, howling wind, along with whatever noises the player or enemies make. Sometimes this works to add to the atmosphere, such as when you’re navigating through the city, but at others it’s just empty. 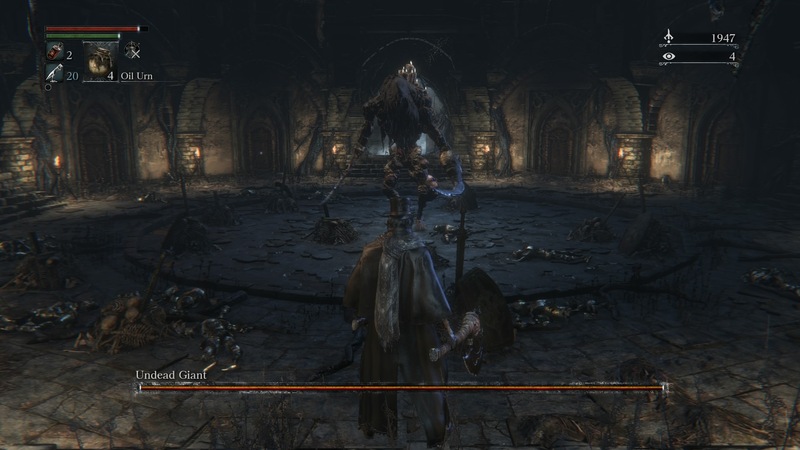 Even in the labyrinth of the Chalice Dungeons, where dead silence feels locationally appropriate, the absence of audio outside of sound effects is simply boring. When there is music, which is nearly exclusively during boss battles, it’s excellent. The combination of dynamic orchestral and choral music is consistently anxious and calamitous, but never tiring. It works excellently to heighten the severity of already challenging fights, and the absence of music during the rest of the game is severely disappointing by comparison. If you’ve played any of From Software’s Souls games, the gameplay of Bloodborne will feel familiar, but with a few key differences. The game is a third-person action RPG with the actual gameplay being a fast and reactionary action style, primarily relying on melee combat. As an RPG, equipment sets, stat leveling, and exploration all play a role in how the player manages. As with its predecessors, this game is very difficult – you will die again and again, and after many you’ll probably want to walk away from the game for a while. But reveling in your own improvement as you progress beyond previously challenging areas is extremely satisfying. When choosing your weapons, you can put a “trick weapon” in your right hand, and a firearm or special weapon in your left hand. The trick weapons can be used in two very different states for different effects, and switching from one state to another can be done whenever necessary, even as part of an attack combo. Some examples include the Hunter Axe extending and being used two-handed, the Threaded Cane switching from a sword-like weapon to a chain whip, or the Kirkhammer switching from a one-handed sword to a massive two-handed hammer. Because the left hand is generally devoted to firearms, you aren’t able to dual-wield melee weapons. The gun’s main use is to parry enemies with timed counters, or to simply interrupt attacks. It can also help with keeping enemies at bay, attacking high points such as a boss’s head, or, with something such as the Cannon, purely for dealing damage. Beyond simply choosing your weapons, you can choose armor based on a wide variety of sets in the game, upgrade your weapons and use non-expendable Blood Gems to change their characteristics, and pick your stats as you level up. One of my main issues with the game comes at this point – many of the integrated RPG systems are not explained adequately. For example, Blood Gems can imbue fire, electric, or arcane damage into a weapon, along with physical damage or status-altering uses. What the game never explains is that each of the four damage elements for trick weapons (physical, fire, electric, and arcane) are mutually exclusive – by equipping one, it overwrites anything else. So if you have very high strength and have a weapon with high strength scaling, but you put in a fire, electric, or arcane gem for damage, your strength stat means nothing – damage and scaling will be based on the arcane stat instead. There are several mechanics such as this that are not explained, as you’re simply forced to learn them from trial-and-error or looking up the details. Implemented within combat itself, there are several factors that come together – your health and stamina, how you use each of your weapons or items, dodging and parrying, etc. For the most part, you need to keep moving while keeping an eye on what the enemy is doing while also managing your health and stamina – looking for tells that will let you parry, deciding which direction to dodge, or rushing in on the enemy to deal damage as quickly as possible. To some extent, it’s a matter of practice, but simply keeping alert can help you react to unexpected circumstances, especially when dealing with large groups. While encounters with average foes generally rely on crowd control capabilities and understanding patterns, boss battles are where you’re truly put to the test. When coming across a boss, you’re forced to figure out a workable strategy, or you’ll be punished for mistakes very quickly. Bosses also become increasingly difficult as the battles wage on, as they’ll pull out the stops and use all of their abilities to attack you swiftly and dangerously. These were the most stressful parts of the game, but in a very exciting way. Being able to take out one of these opponents gives a significant feeling of success, especially if you manage it on your first attempt and without assistance. Another feature of the game, removed from the main story but still relevant, are the Chalice Dungeons. These are fixed or randomly-generated dungeons that become increasingly difficult as they’re explored, and they offer new bosses, different varieties of enemies, and a significant challenge. Being able to move further and further into these dungeons is a great way to break away from the main story for a bit, especially if you’re interested in a co-op challenge. There is an online feature to this game that allows you to either work with others to progress the story or explore Chalice Dungeons, or to take part in player vs. player fights. The co-op feature, while interesting on the surface, is woefully underdeveloped. While you can request help before bosses and normally gain assistance from another player, trying to work through the story with a friend is far more of a hassle than it should be – instead of starting out the game together and working through everything side-by-side, a co-op campaign needs to be done piecemeal. You request assistance, have the other player join “your world,” and then you do what you need to do. But if the guest dies, they need to be invited back. And if the host dies, all guests are expunged. In addition, defeating a boss immediately sends guests back to their world, from where they need to be invited back for assistance. I understand that the story is supposed to be strictly about a single Hunter, but having such a bothersome co-op feature, which could make-or-break the purchase for many people, is very disappointing. Especially since this is a game where you will die a lot. 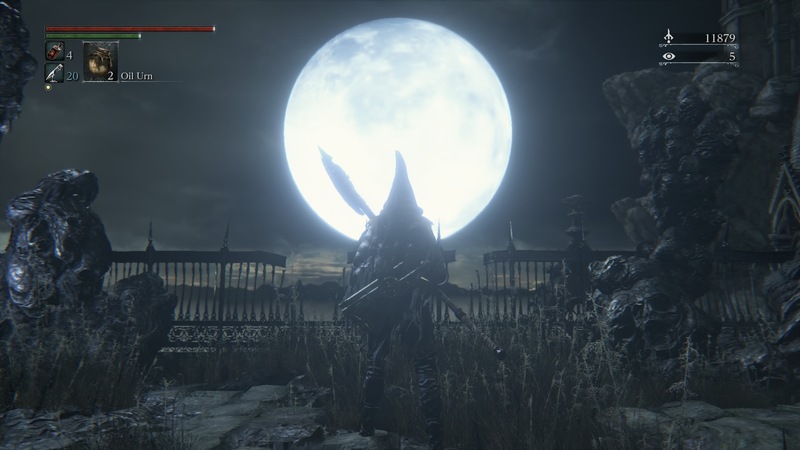 As someone who didn’t care much for Dark Souls, Bloodborne is plenty of fun. While it’s certainly challenging, and dying can set back your progress, it’s rarely tedious, especially since you can always break away from one task to work on side missions or Chalice Dungeons. Opening shortcuts to advance, finding new Lamps, and generally exploring is very rewarding, and the sense of accomplishment from defeating difficult bosses makes the adrenaline-rush battles worth every second. Along with that, this is horror in just about the best way possible, combining an interesting story with an impeccable atmosphere. While certainly not perfect, this game is tons of fun – it just takes a little patience. ± Story relayed through lore more than events, dialogue, etc. 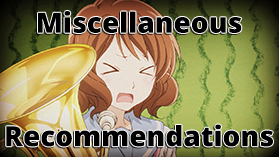 Recommendation – If you’re a patient person and enjoy challenging games, or you’re curious to play an action RPG horror game with an interesting story told in an unusual manner with an awesome setting and atmosphere, absolutely try this out. If you take a more casual stance towards games and prefer to spend the vast majority of your time progressing rather than improving, or you’re uninterested in such an ambiguous story, this isn’t for you. Previous Post Re-creation: A Tutorial? I swear I’ll finish Dark Souls some day .